Tuesday, February 12, 2019 - This lady is trending on social media after she was busted cheating on her boyfriend on live TV. The slay queen had probably lied to her boyfriend about her whereabouts and went to watch a football game with a sponsor. 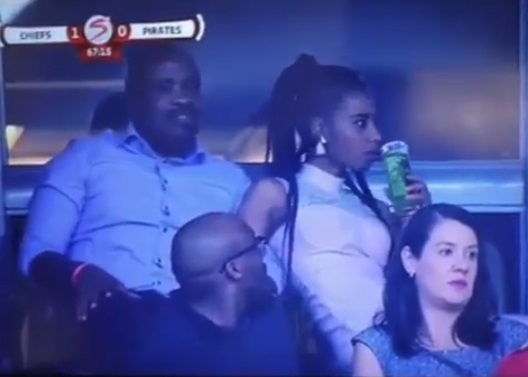 She was holding hands with him and packing the PDA in the stadium knowing nobody knows her until the camera showed their faces on the screen. The guy in front saw her and turned to confirm if indeed it is her and her reaction is priceless.